- set the glossy side of the freezer paper to your fabric and, with a hot iron, adhere it to the fabric. - with some fabric paint and a sponge brush, layer in your color. - when the paint is dry, peel off the freezer paper and voilà! a perfectly painted image. - the next day, I recommend ironing your project again, just to seal everything in. I used regular acrylic paint for the clothespins, and since my Christmas decor is headed into a more woodsy, and rustic direction this year, I decided that one dry-brushed coat was plenty. They almost look more dyed than painted, and I love that. What does your advent calendar look like? What do you fill it with? Truth be told, we keep 2 of them in our home. One for daily holiday activities and Bible readings, and the one the kids run to every morning... the candy one.... hee hee. and a cozy kraft panel, topped with the nicest faux-stitching image. I have a special treat for you today. I recently met up with Marlyn, the über-talented sugar cookie artist of Montreal Confections who basically lives in my backyard - how cool is that! She created a set of cookies inspired by a card I made (you may remember it from *this post*), and all for a virtual cookie exchange on Haniela's blog. I taught this card at my most recent class... it was so fun to show them how to mask the santa hat (from lawn fawn's "hats off to you") and stamp the gnome (from "gnome sweet gnome") underneath the hat. We also masked the trees in the background, to create depth within that layer. All of the patterned paper I used are from lawn fawn's christmas collection. Click on the image to be taken to the app store. I used CSS letter dies, the tree from PTI's "home for the holidays" and a computer-generated sentiment to create this card. With American Thanksgiving just days away, the CSS team is showing off our best "thank you" cards. I thought I would make a little something to send to the gals who participated in the cookie exchange party that my sister and I hosted together. And it all started with an invitation - click *here* to see the beginnings of our cookie exchange paperie. If you host a party, and prep all of your own decorations, here's my best tip for you: use parts of the decoration to create quick and easy (and matching!) thank you cards. I deconstructed the candy cane striped background from one of the leftover voting cards, found an extra tree-shaped cookie image that I had never used, and gently peeled the "mmm..." banner from one of the cookie labels. Even the holiday twine was re-purposed! I removed it from a voting card, and used it to thread a festive red button. The only stamping I did was to stamp the text background on the main panel, and add the "thank you for coming" sentiment, from "favor flags." Just for fun, I added a snowflake pattern to the envelope - which is A4 sized, to match the thank you card. So, happy thanksgiving! And also, see? creating thank you cards can be so quick and easy! I hope I've inspired you to create and send out handmade thank you cards after your next party. Also, who says the holidays have to be all red & green? (me. I do. I say it all the time. But just pretend it's all silence for now...) I'm rocking my favorite red-blue-white combo here... very airmail appropriate, no? If you ever decide to CASE this card, do me a favor and make the gingerbread house detachable, will you? That would have been awesome. A card & christmas ornament, all in one. The more creative ideas only come once the glue has been applied... ha. I can't wait to see your tag creations! 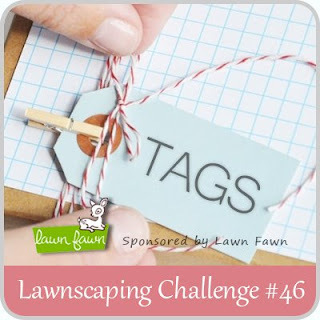 Link them up to the lawnscaping challenge blog and you could win a prize! 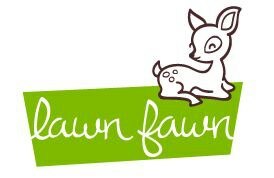 We're being sponsored by lawn fawn this week. Button snowmen are the cutest, no? 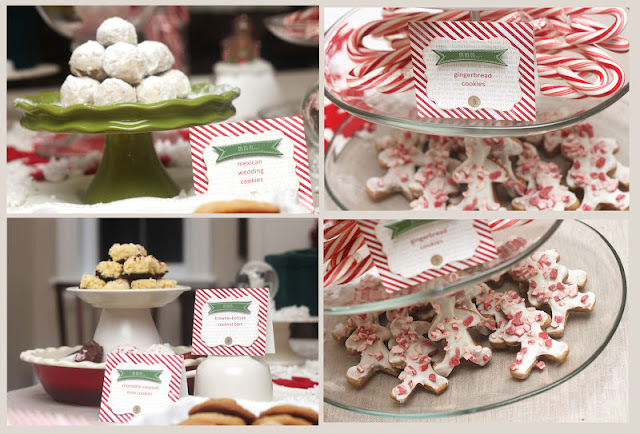 - each guest should bring 1 dozen cookies for each person in attendance, plus an extra dozen for sampling at the party. - pull out some of your own Christmas decorations to set the festive mood, and have the platters set out before your guests arrive. - since we hosted our party very early in the season, I encouraged my guests to bring cookies that would be suitable for freezing. - it was a very fun-filled evening with friends & sweet treats, and I have a fully stocked freezer ready for holiday gifting, as well as 7 new cookie recipes. 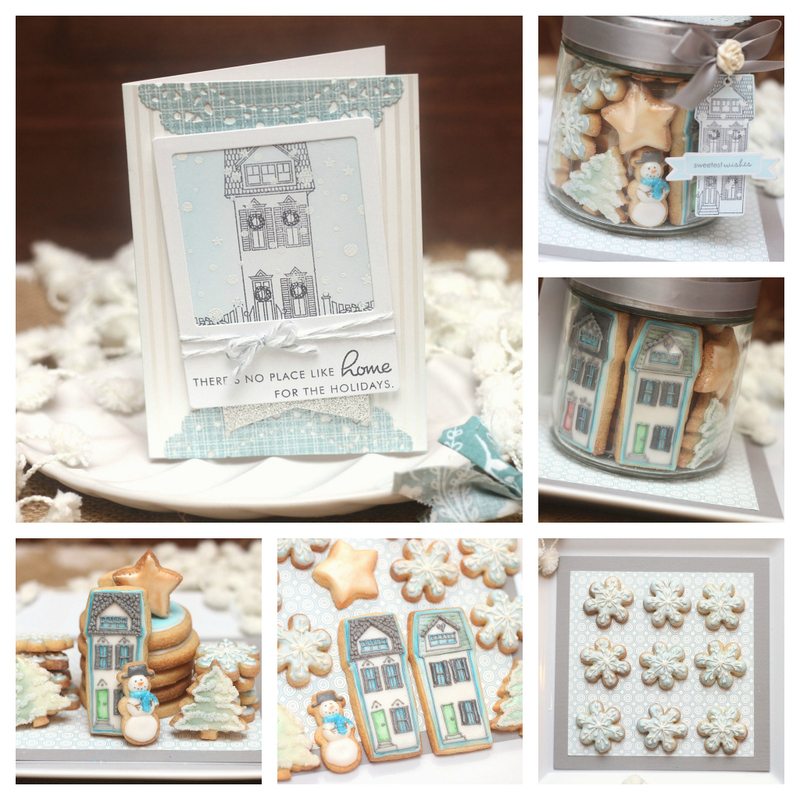 And, if you are crafting your own cookie swap decor, here is a link to the stamp sets you'll need from the Clear & Simple Stamps store: cookie bake, designer lines, favor flags. If you have a minute, I'd love to know if you'll be participating in your own holiday cookie exchange party! So, right now, I have 9 dozen cookies freezing comfortably, waiting to be defrosted for gifts or whatever (and by whatever, I may mean just for me...) It's like the heavens open up every time I peek into my freezer - all of those beautiful cookies! As with any party decor, repetition is key to creating a pulled-together look. So, this invite is the jumping off point for all of the decor you'll see tomorrow. I used 3 CSS stamp sets to make Christmas come early: "cookie bake," "designer lines," and "favor flags." I tucked the when-what of the party onto a second tag shape... I love the personal touch of handwriting on a card, but I don't think everyone needs to see it front-and-center, either... hee. I finally had time to break into my new "believe in magic" set by Mama Elephant. I thought I'd create a step-by-step photo tutorial to show how I made the tag.... enjoy! "Clear and Simple Stamps has made the choice to "go green" and revitalize the CSS current color line. You will see a few new colors and some vintage colors no longer being offered, in an effort to provide product made from renewable contents. All of the color coordinated products are made in the USA. The paper comes from mills that practice responsible, sustainable forestry while manufacturing the highest quality paper products on the market. These mills are powered by renewable energy sources, and our paper products are made of 100% recycled content with 30% PCW (post-consumer waste.) We are very pleased to announce our commitment to incorporate environmental practices into our daily crafting." I created a card, envelope (with a gorgeous liner!) and a wrapped gift... all using the fabulously new "i steel got it" color. It's a beautiful light grey neutral that I know I'll be reaching for all the time. My card features over-sized ornaments, masked to sit as a trio onto a beautiful cake stand. The sentiment creates a frame around the ornaments, and the whole thing rests on glitter and a strip of stamped striped grey paper. The envelope liner was stamped with the same wreath image as the ornaments, and each bow was colored with the same metallic mauve pencil, to tie it in with the card. My final day in a string of CSS posts brings on the mason jar love. I used the smallest mason jar images and the "alpha duo" set to create a fun little thank you card set. I strung up the jars, plunked the letters inside (and outside!) and called it done. And, why not add some jar-shaped stickers? I ran die-cut-and-stamped-jars through my xyron sticker maker. How fun would it be to seal the envelopes with these? lawnscaping challenge: dust 'em off!